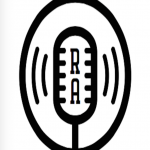 This is my case for rap as a legitimate area for academic, musical research and attention. People variously dismiss rap music as simply vulgar, out only for shock value, and generally devoid of anything that might lead to it being considered as art. However, one needs only realize that jazz occupied the very same position about a century ago: a musical medium that was very popular with the public at large, but which was ignored by the academic music community. I hope to change that mind set. It is my belief that one day rap, having completed the same transformation as jazz music (which was adopted only after being integrated into the works of such great composers as Debussy and Ravel, two of my favorites), will be held in the same esteem. Also, even if you can’t read music, you should still be able to get something out of the following. And if you like this, you might enjoy checking out my 50,000-view article on Kendrick Lamar here, or my 40,000-view article on the most repetitive rappers here — and, if you’re really feeling up for it, check out my opus on Nas here….I mean, honestly, how could I make a website called Rap Analysis and not talk about one of the most technical guys in the game?! As mentioned before, the phrase structure in the second 8 is the same as the phrase structure in the first eight, except for one thing. On the word “UH” after “master p was sayin'”, he elides that 1 bar phrase into the first 2 beats of the next phrase, making itself really a 1.5 bar phrase, and eliminating the 1/2 bar phrase that came in its parallel structural position in the first 8 bars of his verse here. 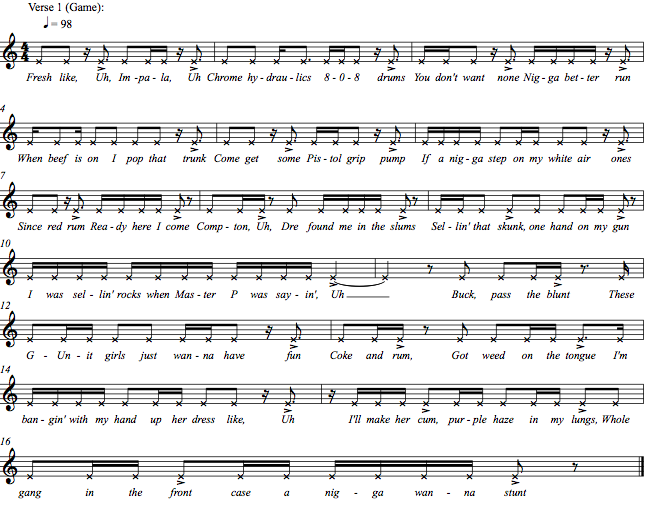 But what really interests me here is the metrical placement in the rhymes of “uh.” Look back at the preceding paragraph, and see how the rhyme changes between being italicized (falling on the beat) and being bold (falling on the 2nd sixteenth note of the beat, a characteristic rhythm of the synth bell riff.) Game sets up the listeners expectation, begins to vary them at the end of the first 8, and in the second 8, varies it even further. The contrast is heightened by the fact that the 2nd sixteenth note of the beat in 4/4 is a highly syncopated place to put a note (which he does in his first 8 bars), which is very different from being right on the beat and not syncopated at all (an idea which he introduces in his second 8 bars.) By the middle of his second 8 bars, the listener has no idea where the rhyme will comes next; this is what makes it awesome. This long term development of where the accent of the rhyme falls in the most exciting thing (to me at least) in this verse. We will see short term development of the placement of the accent in the Eminem verse we take a look at next. That, as well as a variation in the pace at which accents come. For instance, Eminem always has his accents come as fast as possible in our next analysis. But Game varies the amount of his accents in order to build and release tension. Finally, I’d like to draw attention to the uncanny chemistry on this song between 50 and Game. Like they had known each other for years, they expertly pass the rap off between themselves, while sharing and riff off of each others rhythms and verbal structures (For instance, after 50 raps, “You’re now rockin’ with the best / Fo’ pound on my hip, teflon on my chest” in his 16 after Game’s first 16, Game responds in his 2nd 16 with the response, “Ya now rockin’ with the best / fo’ pound on my hip, gold chain on my chest.” Also, see how they both use the “Touch me, tease me, kiss me, please me / I’ll give it to ya just how ya like it girl” idea.) It’s reminiscent of no less than Run DMC, who proved once and for all that rap groups can be better than the sum of their parts. It’s too bad that G-Unit broke up before this could become more. In summary, this is what I get out of rap music. 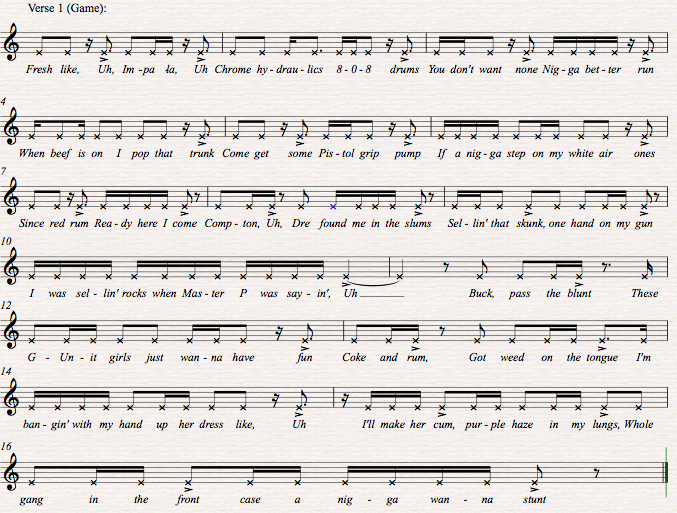 Also, I have the sheet music (all parts, the strings, etc,) transcribed if anyone wants it. I’m working on other analyses like this one right now. Specifically, some Eminem verses, but his rhythms are just so complex (quintuplets!) that it takes a while to write out. Look for them! **Note: my use of the word “phrasing” here varies a bit from how I use it in the next article, the Eminem, and especially from how I use it in the Nas analysis. As I’m doing these analyses one after the other, each one teaches me more and more; please refer to my newest analysis (the Nas one) for my most current ideas on all of these different areas: phrasing, accent, etc. This is awesome, I'm not musical but I always wanted to break down the lyrics way past what people can probably see. Decipher all slang/nicknames — clear up references and what word plays reference to. It would be similar to notating what samples are in a song, perhaps? Hey, this is great stuff. I'd love to take a look at the full breakdowns you've written out if you're game to share them. Obviously this is outside the scope of your designated interests but I'd also be interested to hear your take on the rhythm and lyricality of certain Comedians (Stand-up, which is often compared to Jazz also has a deep rhythm to it, which is why there are so many terrible writers who can still get away with it because they know how to produce things that "sound" like comedy). I have always defended rap music as a form of art. I don't see it with the detail that you do because I don't have that much experience as a musician but I must say that you did a great job analyzing this song. Excellent work. I have been an emcee for years and often thought about things like this. It is incredibly interesting and, I agree that eventually, truly complex rhythms and dynamics will be the lasting truth garnered from rap music. It might take a while for the intelligent music community to catch on, but this is some great stuff here. I have only read this one so far, but I will be reading the rest. This is awesome, I never thought about rap music this way before. I used to be a big fan, now I listen to other stuff most the time. 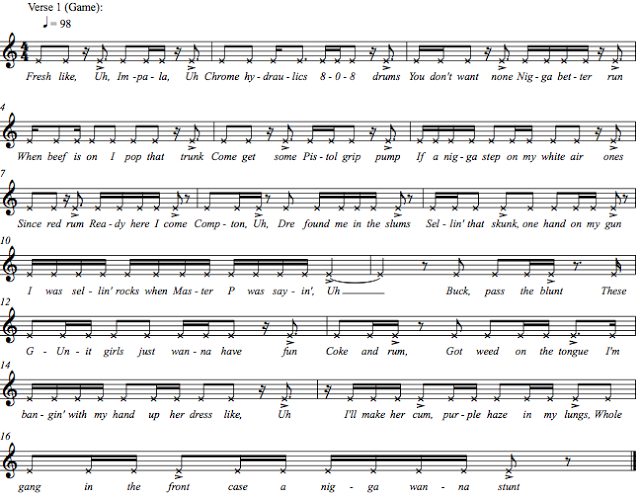 It is funny to see that the songs you picked out for these analyses were some of my favorite songs when I was younger. I'm off to read the next two.